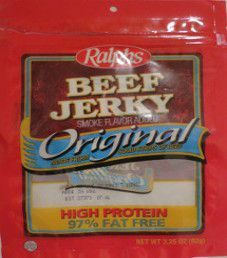 While visiting Calabasas, California in 2011, I purchased this 3.25 ounce/92 gram original flavored brand of beef jerky at a Ralphs store. This being the large grocery store chain Ralphs, owned by The Kroger Co. They distribute this jerky based out of Cincinnati, Ohio, and have locations throughout Southern California.